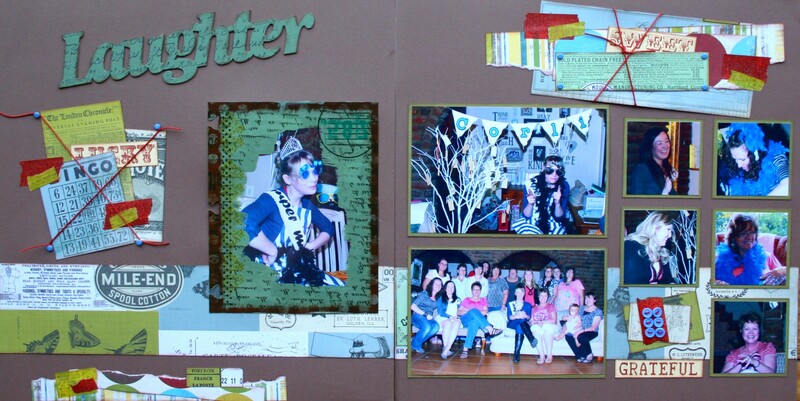 Scrapmaniacs Blog | If you suffer from scrapbooking and all things arty & crafty, this blog is for you! Our youngest is getting married in two months and so much has been going on during the past months. Come to think of it, even more will be going on during the months to come! 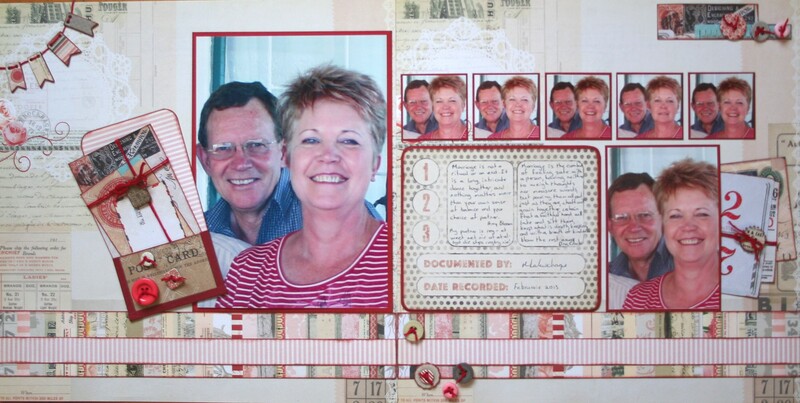 This is a fun layout with lots of unexpected detail including washi tape, a tiny button card and a transparent overlay. 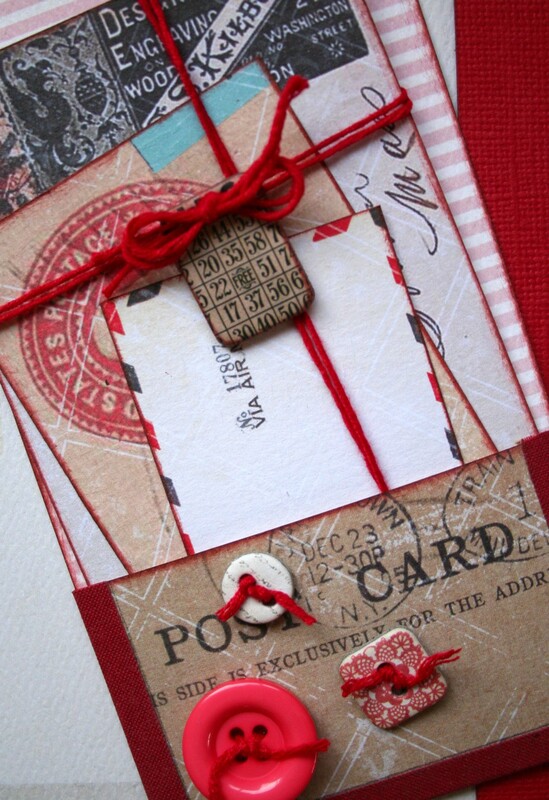 The paper is from Kaiser Kraft’s Pickled Pear collection and I used parts of it with 7G tags to create bundles tied with waxed cord. My father used to say that his best years were when he could still cover all his children with one blanket. I didn’t realise how true his words were until my own children started growing up and worries about minor (and some major) cuts and bruises turned into more serious worries. Worries about their future in uncertain times, would each of them find the right person to love and cherish and spend their life with, etc. (in the meantime three of the four have already met wonderful life partners and worry didn’t have anything to do with it!) I could go on and on and I’m sure those of you with teenagers or grown children could add many items to the list. But I have learned that we have to trust that our children’s roots will stay firm and that the wings we helped them develop will let them soar high and strong! Now I try to just love them while trusting that God would look after them. That way I manage (sometimes) to keep it together! The printed paper is from Authentique and I fell in love with the designs and colours the moment I saw it! 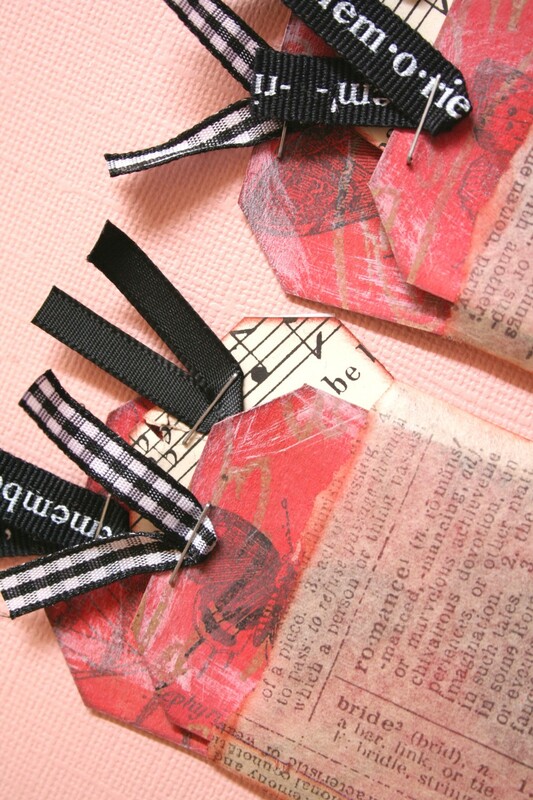 The envelope on the left page is bound with measuring tape trim with flowers from Creative Talents as detail. The trim is repeated on the title and the small pictures on the right page. 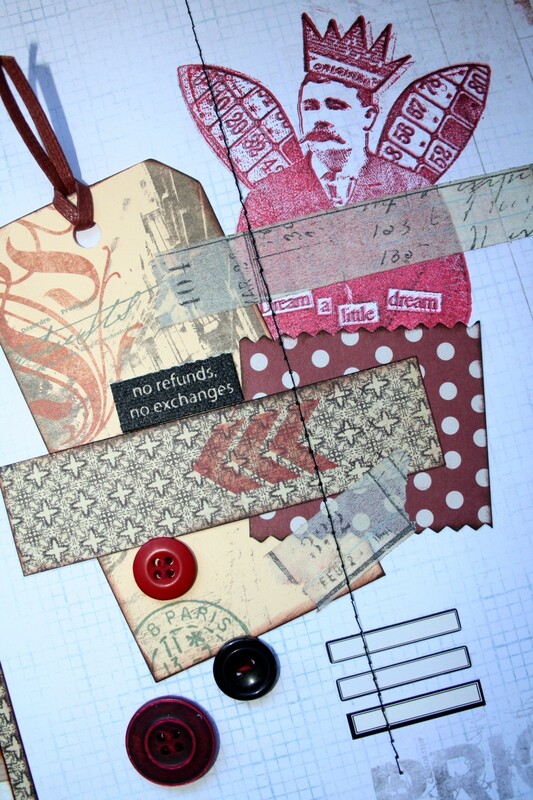 Because I didn’t use a lot of fine detail on the page, the patterned paper is the star of the layout. Looking forward to scrapping with you on Saturday! After a long scrapping drought, I am back in action and I really enjoyed it to sit down and fiddle with scrapping goodies again! With a dead underperforming thyroid and hormones out of whack it has been a battle to keep my boat afloat over the past few months. But there is light at the end of the tunnel and although my memory is still often out of action I just hope that people will forgive me if they have to jolt my memory on occasion. When I started with my layout for our class on Saturday I haven’t decided what pictures I wanted to use yet, but as the layout came together I remembered these pictures and they were perfect! It was early morning in the mountains and with everybody else still asleep, I slipped out quietly and sat down at the water’s edge. As I enjoyed the view of the impossibly green summer mountains I experienced the most serene and peaceful feeling. It was as if the water ran right through me, taking with it all the stresses and worries that is so part of being human. I didn’t realise that Frans had woken up in the meantime and was photographing me through our bedroom window. I made envelopes with fragile photographic dry mounting tissue that I bought from a dealer in second hand goods some time ago. 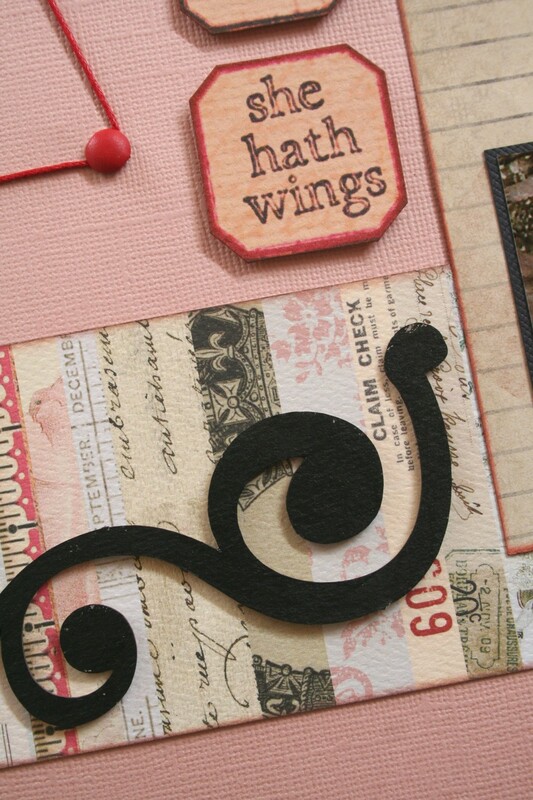 I used black ink to stamp onto the envelopes for added texture and filled them with music paper tags and tags made from Tim Holtz’ Kraft resist paper. 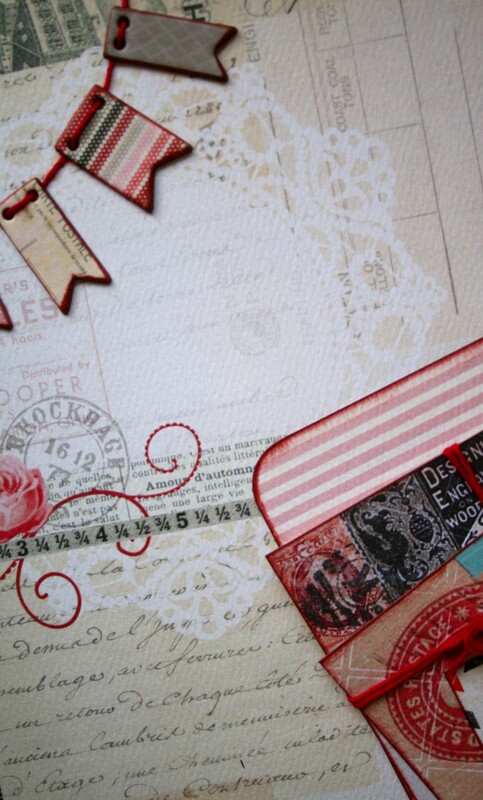 Back flourishes and cards from red lead paperworks add to the theme. 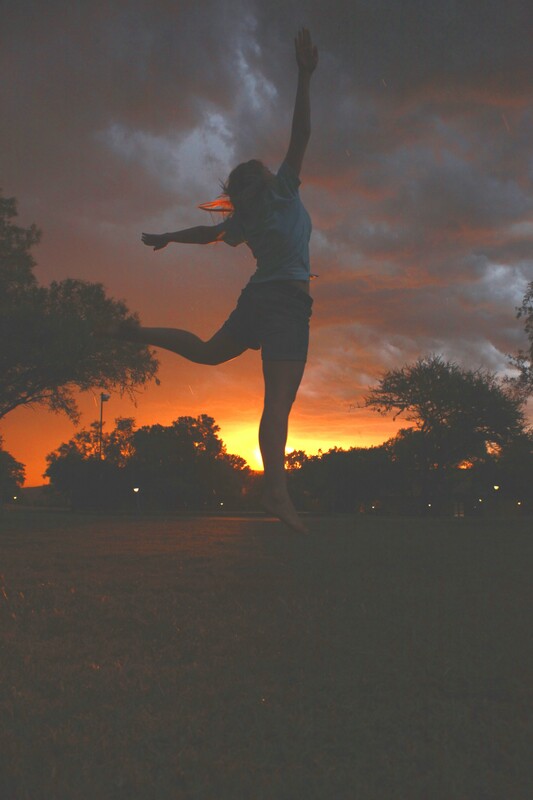 Come feel your soul blossom en let yourself fly on Saturday! according to Janet Long and I totally agree with her! If I am not a little bit crazy every now and then I will go completely crazy. Serious! As adults we have to deal with an enormous amount of stress just to keep the wheels on the bus. But sometimes I close my eyes and refuse to see the wheels coming off – or even take the wheels off to allow that little bit of craziness to keep me sane. Does that sound insane or what?! During our family camp a few weeks ago we had the opportunity to catch up with everybody’s bits of craziness and the kids joined in with abandon. We camped at a resort north of Rustenburg on the Zeerust road and although it was deep in March already it was sizzling hot. Of course Ms Photographer couldn’t keep her hands off her camera and took some gorgeous shots of a beautiful sunset. 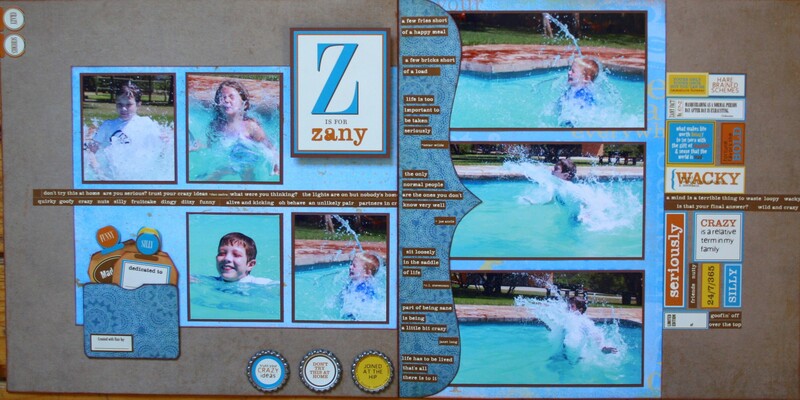 The children enjoyed the swimming pool in the hot weather and I decided to use these pictures on my layout for Saturday. The background is Kraft paper and I used various printed papers in blues to match the 97% complete stickers from 7G. Walnut ink magically transforms ordinary manilla tags into rustic tags and I used them to fill a pocket on the left page. 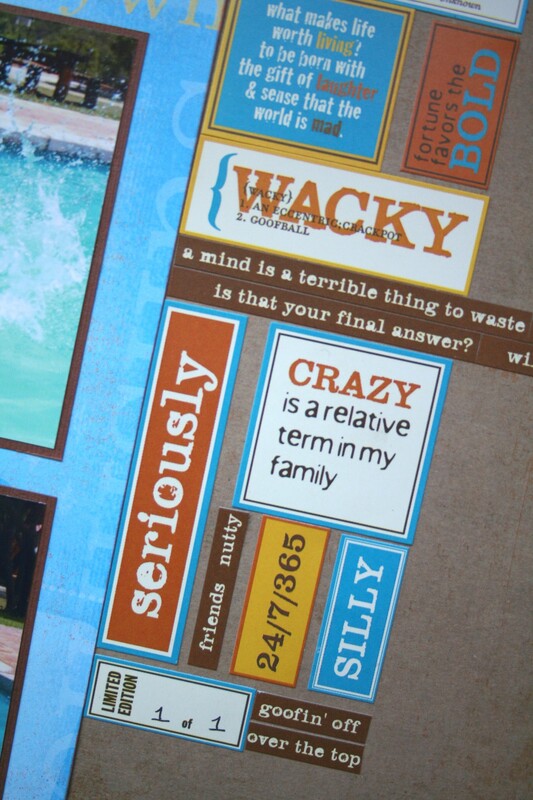 I used the brown strips with quotes as a band through the middle of the layout and clustered some of the stickers on the right page. 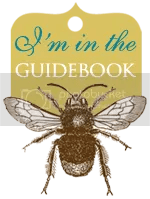 This is a fun layout suitable for a wide range of photographs and I hope it will bring a smile to your face as it did to mine. See you on Saturday! is what a relationship is. It is when you or your partner don’t get it right or fall out of step that toes are stepped on and feelings are hurt. If the partnership is worthwhile you have to start again and learn new steps that both of you can manage and appreciate and create your own special dance all over. 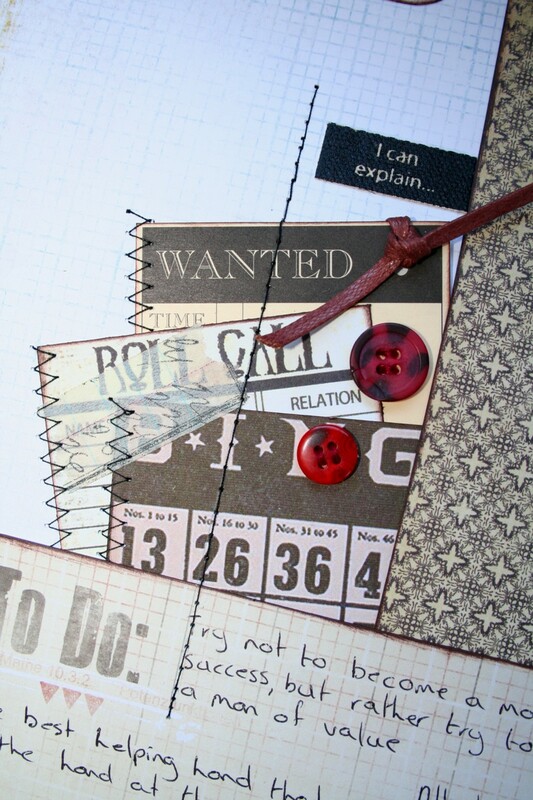 My layout for this week is about a special relationship and I used beautiful paper from Lost and Found and combined it with Basic Grey and 7G for a little whimsy. 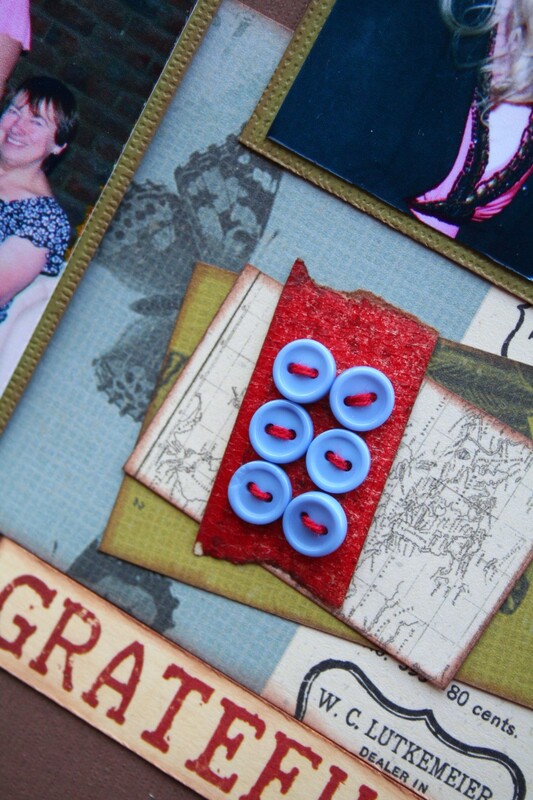 I cut up the Basic Grey paper and created a pocket to fill with post cards bound together with Seweasy floss from WeRMemoryKeepers. 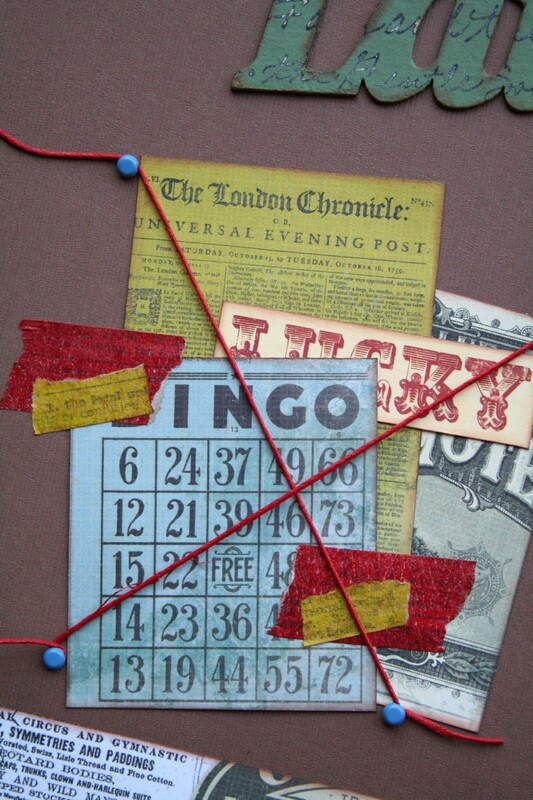 Together with the buttons from Lost and Found came some flags that I used to create bunting in the top left hand corner of my layout. The paper that I used for the background is my favourite paper in a long time! 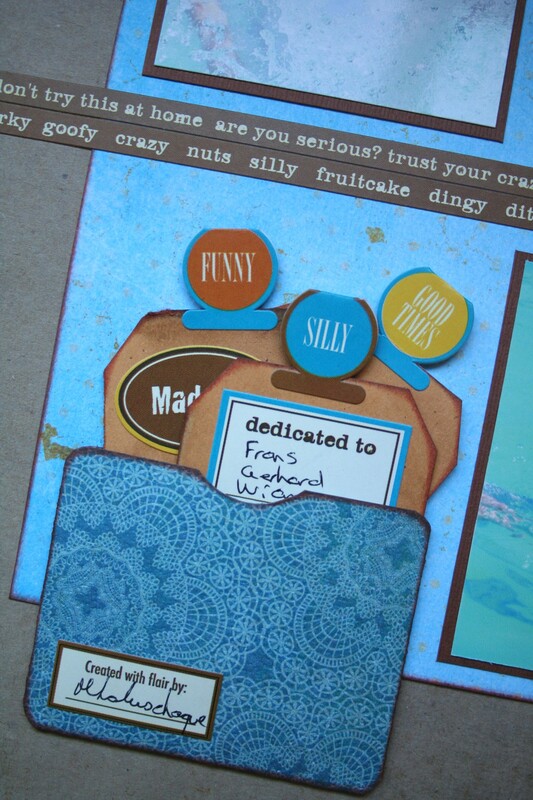 Come share the love on Saturday when you will create a layout about a special relationship in your life. The four of us sat huddled together on the couch. The boys listened intently to me reading – in character – from Rumpelstilskin: “……and a small, funny little man entered the room and asked: Rumpelstilskin, why are you so sad?” Upon hearing about Rumpelstilskin’s dilemma of having to spin straw into gold before the morning, the funny little man sat down at the spindle and completed the task for her. For a while we were transported into a world of magic and wonder through the story. As adults we do not often have the opportunity to be part of this mystic world of magic and wonder. Aaaah … that feeling of drifting away on a soft cloud with your eyes closed and reality just a distant memory… But when our family comes together we LIVE a story for a while! 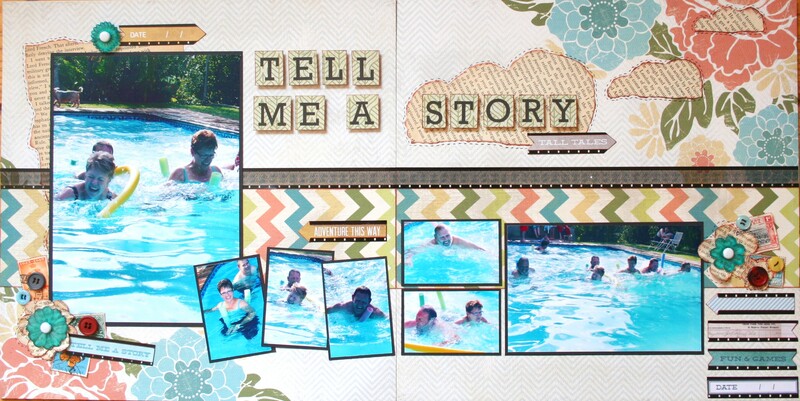 My layout for this week is titled ‘Tell me a story’ and I used old book paper to create fluffy clouds to carry me away 😉 I used pictures of me and my siblings having fun. The film strip above the zig-zag paper is from a real old movie roll that Frans bought in its case from a second-hand shop! Postage stamps remind me of the letters we used to have before e-mail and sms’ that brought news and stories from someone else. 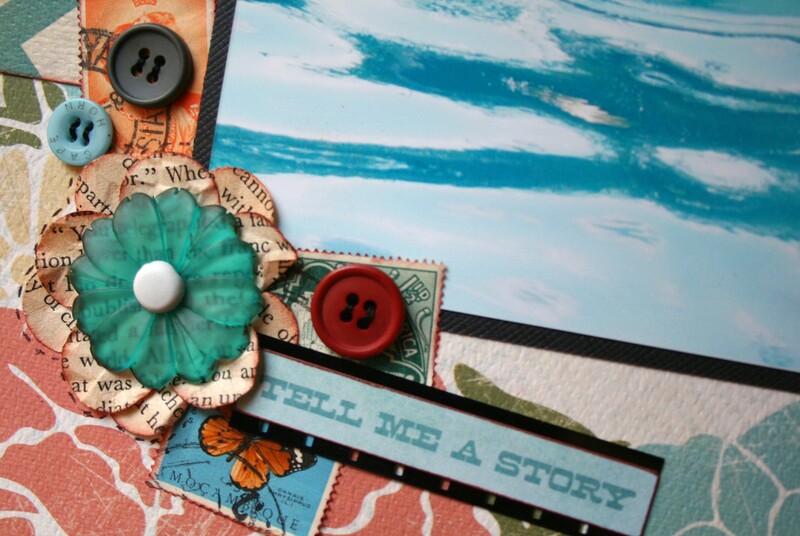 I punched flowers from book paper and used it with the stamps and buttons to create clusters on the background that lead the eye from left to right on the layout. 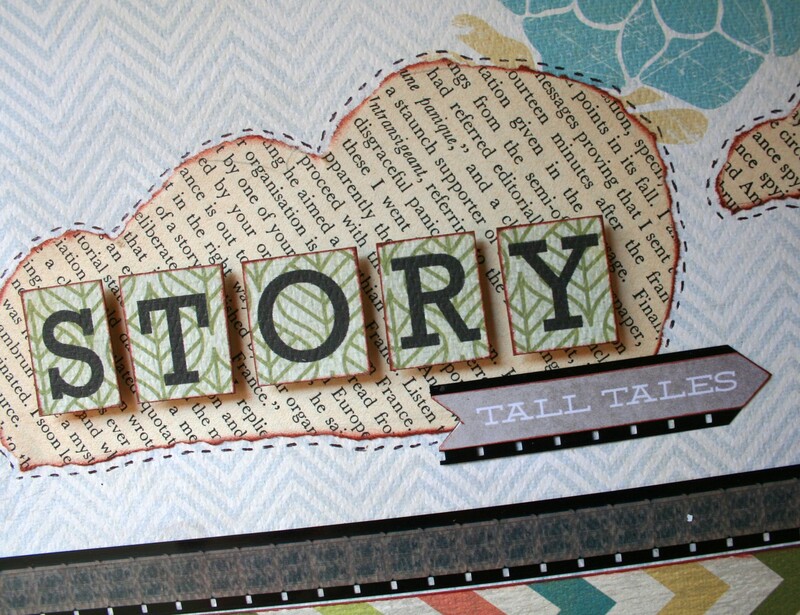 The book paper and film strips tie in with my ‘story’ theme and part of the title sits on a fluffy book paper cloud .